Comfort, authenticity, well-being in one of the most beautiful sites of the Vercors. Summer and winter, La Ferme des Glénats is located in a beautiful environment and enjoys an exceptional view of the cliffs of Rencurel, the Gorges de la Bourne and Great Flycatcher Villard de Lans. It has been renovated in a mix of stone and wood and everything has been designed for your well being and comfort. Located on a gazebo surrounded by nature in the small hamlet of Glénats to 950mtr above sea level, the farm Glénats is ideally located 20 min. Ski slopes of Villard de Lans and 5 min. tracks Alpine and Nordic skiing Romeyere COL. The GR9 which crosses the hamlet of Glénats allows you to go directly from home for many ballads. The hamlet is located on the heights of the village of Rencurel and enjoys a ensolleillement exceptionnnel. The house and its beautiful gardens have a full southern exposure. 2 bathrooms, sauna, separate WC 3, Covered terrace, large garden floors. living room living-dining room, kitchen with views, underfloor heating, covered terrace. Large garden with 2 terraces. Upstairs: 3 bedrooms, 1 office, 1 WC. The house is designed to 8 beds. The house is further down the road. Around the house there is a very beautiful garden bloomed about 1000mtr with stunning views. Following below is the forest without homes. The house is located at the end of a dead-born, there is no traffic and children can play safely. The garden is south facing. We can put in the shade in the hammock under the big ash tree. There is a sandbox (whose lid can be used as a small pool for children). The kitchen offers a beautiful view of the valley and the Rencurel ski area Villard de Lans. It is a nice and bright room very appreciated by all .. From the kitchen you have direct access to a covered terrace of about 10m where you can have meals around a large table. In the garden of the bottom there is a wooden solarium where you can sunbathe in peace without being seen. .
A very beautiful and well-maintained farmhouse in a stunning location. It combines the best of old and new with simple elegant modern interior, with just enough touches to make it seem personal. The massive sauna room is bound to be a favourite winter or summer. The views from the kitchen will make everyone volunteer to cook. We came for a family wedding in June. There is also a wonderful glass reading writing room which would inspire anyone. The weather was perfect, the location kept everyone calm and relaxed and made the whole wedding experience a week we will never forget. Vjera and Patrick were charming and helpful without being invasive. Highly recommended! Un Noël comme on en rêve ! Nous avons passé Noël chez Vjera et Patrick : une semaine au top ! Nous sommes arrivés dans une magnifique maison, très confortable, toute décorée pour Noël avec un magnifique sapin !! Les pièces sont spacieuses, aménagées avec goût (les photos reflètent la réalité), la literie est impeccable, le foyer fermé un vrai plaisir et le sauna ... la cerise sur le gâteau ;-). La vue de la cuisine et du salon est superbe (orientation plein sud). Il nous a peut être manqué un peu de matériel de cuisine et de vaisselle pour nos 7 personnes. Alentour, un paysage superbe et des balades au pas de la porte. Vjera et Patrick habitent juste à côté et restent à notre disposition en toute discrétion. On recommande à mort !!! NB: le linge de maison n'est pas compris dans le prix de la location. quelque chose pour votre confort. Je vous contacterai pour savoir quel matériel de cuisine je dois rajouter. Mais nous avons surtout profité du jardin, ombragé, avec des espaces différents, des fleurs et ds papillons présents en grand nombre, de la terrasse pour tous nos repas, du matin au soir. Grands et petits se sont sentis vraiment bien dans ce cadre de vacances en moyenne montagne, idéal pour des familles. Et L'accueil de Patrick et Verja toujours aussi délicieux....Nous avons dit "jamais deux sans trois", alors nous y reviendrons surement une autre année, avec les enfants qui auront grandit un peu.. Merci pour tout Patrick et Verja. Marie Claude et Jean Michel. Ein empfehlenswertes Basislager mit wunderschönen Aussicht, um den abwechslungsreichen Vercors zu erkunden. Tiptop ausgestattet, tolle Küche mit Panoramafenster, toller Garten, schön hergerichtetes altes Haus. Unsere Kinder lieben es. Patrick und Viera sind supernett und können tolle Tips zum wandern/biken geben. Und bei kühlem Regenwetter ein paar Holzscheite in den Kaminofen, Buch geschnappt und dann wirds kuschelig gemütlich, oder ab in die Sauna. Hier ist Erholung garantiert ! 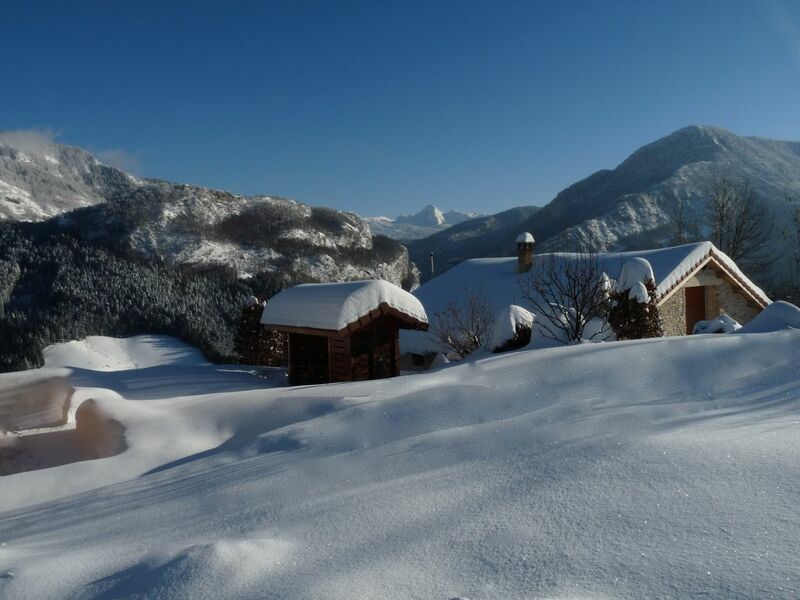 The Farm Glénats is RENCUREL in the Regional Natural Park VERCORS 20 minutes from the slopes of Villard de Lans / CORRENCON or more than 250 artificial snow cannons guarantee snow from Christmas to early April with a vertical drop of 1000 meters. The Vercors massif is a pre Alpine medium mountain located between Grenoble and Valence, straddling the ISEREet the Department of DRÔME. The REGIONAL PARK Vercors has one of the largest nature reserves in France. It is a land of tourist reception in winter with ski resorts Alpine, Nordic, Snowshoes. Summer with walking, climbing cycling. There is a beautiful mountain golf (18 holes) CorrenÃ§on 17km from home. The small village of RENCUREL is located in the heart of the magnificent forest of Coulmes between the canyon and Ecouges GORGES OF THE BOURNE. Cross-country ski area in winter, this is a fabulous hiking terrain summer. The massive Coulmes is a nature jewel in the heart of the Vercors. A Rencurel the Romeyere OF COL of Station welcomes families in alpine skiing.